Childs Mountain lies mostly within the boundary of the Cabeza Prieta National Wildlife Refuge. It is the only place on the Refuge where it is possible to drive to the summit ridge of a prominent peak (elevation, 2846 feet) and one of very few such places in the entire region. Tours of Childs Mountain are sponsored and conducted by the Cabeza Prieta Natural History Association. The road to the summit was built in the late 1950’s to service an Air Force radar installation constructed at that time. It is now locked and the area is off limits to the public except during these tours. 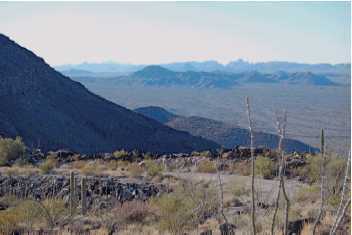 View south with Kino Peak in the far distance. foothill and blue paloverde, triangle leaf and white bursage, brittlebush, saltbush, chain fruit cholla, buckhorn cholla, saguaro, hedgehog cactus, Engelmann prickly pear cactus, ocotillo, creosote bush, grasses and annuals. West and northwest - In the Childs Valley you can observe the dendritic pattern of washes, which stand out as darker lines of vegetation on the valley floor, the Growler Mountains including Growler Peak which is the highest point in the Refuge, and Charlie Bell Pass. On clear days you can see the floor of growler valley through the pass. North and northeast - Beyond some air force targets on the valley floor you can see Crater Range, Black Gap, Gila Bend Mountains, and the Sauceda Range, in which Hat Mountain is prominent. East - Look for Batamote Mountain and, behind it, Coffee Pot Mountain. 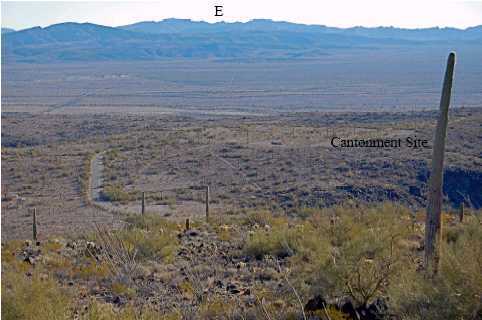 South - Find the Little Ajo Mountains, Black Peak, the Ajo Range, Kino Peak in the Bates Mountains, and, if conditions permit, Pinacate Peak in Mexico will be visible on the horizon. Built between 1956 and 1958 as part of the North American early warning defense system designed to detect Soviet long-range bombers, the Ajo Radar Station soon became obsolete. Operations were ended in 1971 and the station was abandoned in 1972. Radio facilities that continue to operate on Childs Mountain are now completely automated. During the time that the station was manned, housing for military personnel comprised two areas: living quarters for families at the base of the mountain and a cantonment for unmarried personnel on the shoulder of the mountain just east of the summit. It housed between 125 and 175 servicemen. Houses, barracks, commissary, and other buildings were dismantled and removed in the mid-nineteen nineties. The roads that serviced the station were back graded and seeded. Today, almost no sign of them remains.